FRIPP ISLAND, SC -- I think we're all familiar with the playing career of Davis Love III, having watched him grow from an over-swinging but incredibly talented college kid at North Carolina to eventual PGA champion and perennial Ryder Cup participant. We've also seen him in his younger days -- the film footage and photos of Davis Love Jr. tutoring his children in the right way to play the game -- and the dignified way to respect its traditions. We all know of the tragedy that's touched Love's life, and the dramatic way he won the PGA Championship at Winged Foot. I'll never forget the rainbow shining down from a break in the clouds as he approached the 18th green to close out the victory -- it was truly the 'sign from heaven' that his father was watching from above. Gives me goose bumps just recollecting it all. Right near this spot is where Forrest Gump saved Lt. Dan -- in the movies. Here, it's an incredibly beautiful par three (6th hole). In other words, we've learned a lot about him -- and we like what we see. One way we haven't known him, perhaps, is for golf course design -- and that too, will change as time passes. 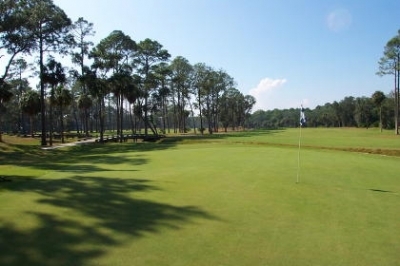 Ocean Creek Golf Club at Fripp Island Resort was Love's first design project, and together with subsequent works such as Eagle's Pointe in Bluffton -- will help place Love Enterprises on the map in the world of golf course architecture. Mark Love, Davis' brother and design partner, says Ocean Creek was the first embodiment of a childhood interest: "We've always been fascinated with golf course design -- our father was involved in it, and as kids we sometimes used to doodle the types of golf holes we'd like to see. Then as Davis' playing career progressed, he's had some opportunities to put his name on some projects -- but wouldn't do it unless there was an occasion to take an active role. It just turned out that the situation at Ocean Creek seemed like a good place to start that facet of Davis' life." Take a bridge to reach the 11th fairway. And if it looks narrow out there, its because it is. Love continues, "The routing had already been planned out for the most part by Paul Cowley, and our family friend Bob Spence was involved with the construction -- so we came in at a good time to add our impressions to the project. 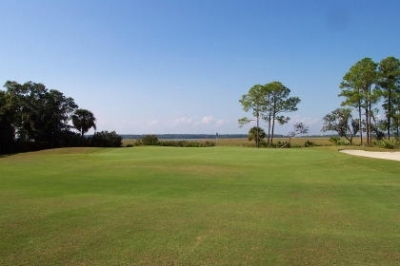 At Ocean Creek, we worked with a fairly small tract of land by today's standards, and a relatively modest budget. Despite the limitations, the end result was something we were proud to put Davis' name on. It also was a good project to help found our firm." Indeed it is. 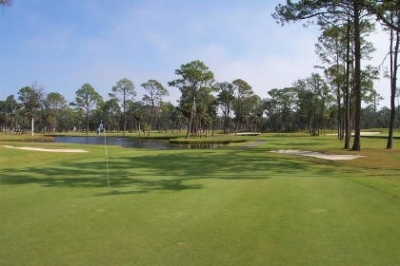 Dave Stewart, Fripp Island's Managing Assistant Professional, says the land containing the Ocean Creek course was always very beautiful -- and he's not the only one who thinks so -- it even attracted the attention of some Hollywood producers. Several of the Vietnam sequences in the movie Forrest Gump were filmed near the tidal marsh that skirts holes 5-12, as was a good portion of Disney's Live Action Jungle Book. 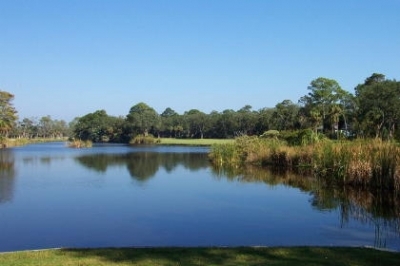 "Much of the course was built along a lake known as 'Hidden Lake,' and also 'Old House Creek.' That's where the 'creek' in 'Ocean Creek' comes from. Before the course was built, it was a very peaceful, scenic, undisturbed piece of property -- and I'm sure that's what attracted the producers of the movies that were filmed here," Stewart added. There's even a monument to the Gump movie -- placed thoughtfully near the fifth tee box. It's the 'Forrest Gump' bench, and there's a plaque that commemorates the spot where Forrest saved Lt. Dan. If you glance around, you can still see some telltale signs of where the scenes were shot -- in the form of pyrotechnic-scorched palm trees. Sure enough, a look out towards the marsh will certainly bring flashbacks from the film. Nothing but water lies between the tee box and landing area of the par 3 13th hole (back tees). A tough test of nerve, for sure. I don't want to give the wrong impression -- these interesting historical tidbits hardly overshadow the golf experience, or take away from the fine work the Love firm (and Paul Cowley) did in creating the golf course. There's certainly enough there to stand on its own, and would be noteworthy even without its famous theatrical predecessors. Mark Love explained that because of the site's small size and budgetary constraints, they put more water on the course than would be typical for a Love Enterprises designed course. "We usually like to make courses a tad more playable for the average golfer -- but because of our budget, we took all the dirt we needed from the site itself -- and in order to do that, we dug more lakes than we perhaps would have otherwise." "There were several nice sand dune ridges running through the property, so that helped to give it some natural elevation variance. We tried to work those into the design as much as we could," Love said. Though Ocean Creek is fitted onto relatively modest acreage, you still certainly get the feeling of solitude. Here, the 9th green. As mentioned before, there is quite a bit of water on the course -- probably not as much as its sister course (Fripp Island's Ocean Point), but the lost ball potential on Ocean Creek is just as high. 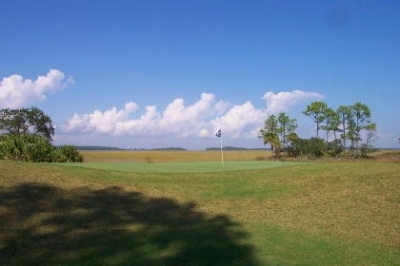 And whereas Ocean Point emphasizes ocean views, you'll get tidal marsh views at Ocean Creek. The day I played was fairly warm with some real nice thunderclouds in the distance -- providing quite an enchanting picture when combined with the marsh views. The marshes aren't Ocean Creek's only contrast from its sibling -- there aren't nearly as many homes bordering the fairways as Ocean Point -- though there are more under construction on a few holes. Even when the real estate development is done, there still won't be a single home touching at least half the holes. Although there is quite a bit of water on the layout, there are more than generous driving areas on most holes -- something Love likes to provide for the average golfer. Mark Love says it's always their goal to set a course enjoyable enough for his mother to play, while also challenging the better player at the same time. "We'll accomplish a lot through working with the green complexes. We'll set it so the average player can get up and down without too much trouble -- make a few pars and a lot of bogeys and move on -- but we'll make the greens difficult enough where better players must be precise with approach shots to give themselves birdie opportunities," Love adds. The 3rd hole is an attractive, straightforward par three. Turning to the layout, Love starts the course off with a fairly tame 505 yard dogleg left par five, featuring quite a wide driving area sandwiched between trees on both sides. Because of the bend in the fairway, it's probably not reachable for the vast majority of folks -- unless you can land a fairway wood high and soft over a large bunker that guards the frontal approach. But the large green is receptive to high lofted third shots -- a good hole to start off with a par. As Mark Love alludes to above, the greens at Ocean Creek are definitely friendly to the average player (at least getting to them) -- very large and open to run-up shots on many holes. The bunkering is adequate and strategic, but not omnipresent. Once you're on the putting surface, however, you'll need to bring your 'A' stroke, because there are some severe undulations and a couple tiered greens. If you're in the wrong spot on the green, it's a challenge to get home in two putts. This design philosophy is perfectly demonstrated at number four. It's a well- conceived potentially drivable par four, 312 yards from the tips (but often plays forward, more like 260 to the front), and very open in front of the green. There are trees to the right, but very little prevents you from ripping the driver as close as you can get it -- I myself was about pin-high with the drive. But don't think 'automatic up and down for birdie,' because the green has a large 'soup bowl' depression guarding potential pin placements. It'll make your chip extremely tough, and making par isn't even a given. Great hole. Take a bridge to the green on the second hole. It's your first crossing of water, but there's a lot more to come. Hole five's got the Forrest Gump bench and moves towards the marsh. Holes six through eight are probably the most scenic on the course, offering beautiful and serene marsh views -- extending as far as you can see. Good golf, too. Six is a 185 yard par three, calling for a high and soft tee shot to a bunker-less large and undulating green. Seven's the #1 handicap hole, probably because of the preponderance of wetlands to the right side of the fairway and in front of the green -- a double target hole. There is an option for long hitters to try and clear marsh that juts out into the fairway, which widens the landing area considerably. But this hole will definitely live up to its high handicap designation for most duffers. Eight through eleven border 'Hidden Lake,' and the water comes into play to varying degrees on each hole -- probably the most on number eleven. 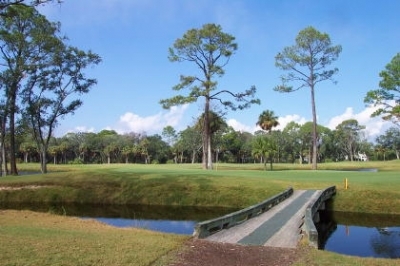 This link offers the most intimidating tee shot on the course -- nowhere to go but the fairway. Water to the left, water short, and water and wetlands to the right. Thank God for the red lateral hazard stakes! I think this hole plays tougher than number seven and certainly merits its #2 handicap designation. Once you reach the 17th green, you've come back to the the incredible marsh views of Fripp Island Resort's Ocean Creek Course. The middle sequence on the back nine moves away from the marsh, but returns at number seventeen -- and contains more thoughtfully plotted golf holes; not a weakling in the bunch here. The round concludes with another par five -- 520 yards and a slight dogleg right. Clearly set up as another risk-reward type three-shotter -- though the green is higher than the tee, so the chances of reaching it in two are pretty slim. A good hole to end the day with. 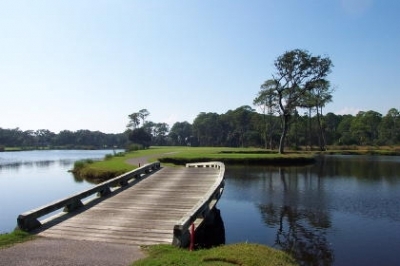 Summing up, Ocean Creek is a peaceful, uncrowded, scenic trip through a naturally beautiful piece of property -- and compliments the overall feeling you'll get at Fripp Island Resort. The Love group (with some help) did quite a job with their first project, and laid a foundation for future successes -- another accomplishment to add to the already distinguished reference list of an American golfing family. Rates vary according to season -- $60-84. Replay rate (or play Ocean Point) for $25 more. Rates include cart (cart path only). Unrestricted walking, seven days a week.